When you think family fun—the kind where the kids can’t stop smiling, splashing, laughing, and loving it all—few places (if any) can compare to Great Wolf Lodge. 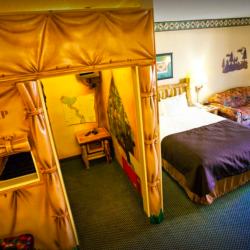 Opened in 2003, the lodge has become one of Traverse City’s “go to” destinations for families, especially those with young children, looking for big fun in an all-inclusive resort experience. The big draw for Great Wolf Lodge is, of course, the waterpark. In simplest terms, it’s a 5-year old’s dream come true. Here kids can swim, splash, slide, and slalom down a river canyon in all their wet and wild glory. They can float a lazy river, play in a kiddie pool, explore a water tree fort...and the list goes on. Parents have the choice to join in on the fun, lounge by the pool, or soak in a hot tub. Given all these activities, families definitely need to refuel. Fortunately, the lodge has several appealing dining options. Families can start their day at Camp Critter Bar & Grill with a hearty and/or healthy breakfast. Hungry As A Wolf offers pizza and sandwiches for lunch and dinner. For a quick snack, there’s Buckets Incredible Craveables. To end a meal on a sweet note, there’s Bear Paw Sweets and Eats. 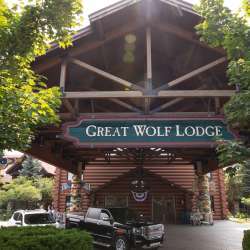 In short, whatever your appetite, Great Wolf Lodge has something to satisfy everyone.